You tell us that HipBar is approved by Reserve Bank of India and is expected to become the 'go to place for ethical marketing and responsible consumption of alcohol'. How do you plan to integrate all stakeholders of the Indian alcohol industry to converge on HipBar? There is enough evidence around us, in terms of business models to show that the world is moving towards a shared economy. Given the reality, HipBar views technology as a great unifier and enabler. By using technology, we hope to usher an effective, transparent and sustainable digital ecosystem for the beverage alcohol industry. Let’s start with the customer. At the core, he gets a wider choice, greater value and therefore a better experience through HipBar. 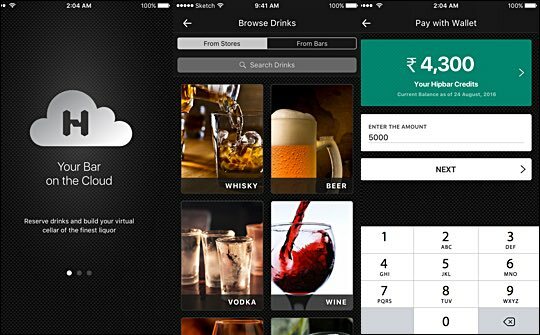 He will be able to build his bar on the cloud and digitally stock his favorite drinks at preferential rates. He can access his bar whenever he is out for a drink and get served from it. He gets rewarded for brand patronage. He can get on to subscriptions for beers and wines from his neighbouring bottle store. All this will align with the digital behavour and cashless spending, which is becoming the order of the day in India. There is a certain level of flair we plan to add to the core offering as we roll along. For the on-trade and off-trade partners, we bring in the benefits of hyper-local relevance building, and most importantly the ability to talk to the right audience who matter to them. We will help them improve their revenue and profitability by providing them intelligence backed by data. For beverage alcohol brand partners, they have the opportunity to build efficiencies in the trade marketing and consumer outreach functions. We are creating a new class of virtual assets and a brand new sales channel for them to monetize. Overall, there is a win-win for everyone in this game. How will HipBar spur demand and help the industry? Firstly, HipBar will enable the industry to cut fait accompli leakages and foster a better system of consumer marketing, both in terms of effectiveness and efficacy. By being an online-to-offline channel for the industry, we expect to create qualified demand where marketing and sale have a strong positive correlation. Lets’ look at who are the HipBar customers. They are people who are of LPA, who enjoy a drink, and who have a digital lifestyle. Now, our job is to help them make informed choices and offer them a ‘better than before’ value and experience. This is what we intend to do. How will this help wine and other categories in the industry? Wine and other experimental categories will find immense use with the HipBar and vice versa, including opening up reservations for upcoming vintages and limited editions. Even without a large sales force, they will be able to operate with much more control and predictability. India already has several mobile wallets and now payment apps by banks. Why will consumers use HipBar? 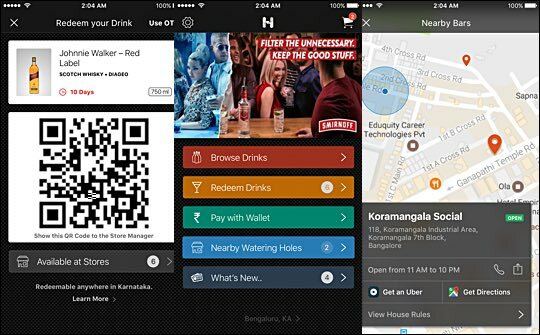 HipBar is a digital currency that can be used only at watering holes and licensed bottle stores. It’s a wallet for nocturnal thrills and not the electricity bills, and in that sense its much different from other ubiquitous mobile wallets. HipBar consumers can experience the privileges of pre-paid – value, convenience, priority access, predictable experience, and hassle free checkout. Your app doesn’t offer home delivery unlike Drizly, Saucey etc in the US. Why will the consumer opt to order through your app? HipBar cannot and does not do any home delivery of alcoholic beverages. But when it is permitted by law, we will be interested to look at it. The customer will find sufficient reasons to make their choices through the app, and that’s our business to create those reasons. Indian excise doesn’t allow online sales of alcoholic beverages. What regulatory approvals does HipBar have in place? We don’t sell alcoholic beverages, we facilitate payments. That’s our core IP. We have been able to demonstrate our legitimacy with the regulators and we are well within the framework of the extant laws and regulations. How will you control underage drinking through the app? All retailers and bar partners of the HipBar network have signed up for being part of a responsible consumption network and are obligated to follow the highest ethical standards. In addition, we have two-way reporting of breaches and in reported cases can run e-KYC checks to verify age of the customer and exclude any person found be below LPA. How will you address the tracking of sales and marketing spends by brands? It’s a self-service model. We give full access to the brand managers through a dashboard (web application) to monitor and control everything. We will be constantly improving this side of the product based on feedback from brands, including adding more intelligence when the data starts flowing. How many retailers have accepted the HipBar proposition? In Bangalore, which is our launch market, based on concept selling we have 50 key retailers (mostly modern trade) who have signed up. Many others are in the process of doing so. How is your venture funded? Currently, HipBar is funded from my own resources, close friends and family have also pitched in. The business would require further capital infusion and we will be talking to investors after rollout. We are a tribe of engineers, bankers, artists, designers, lawyers and digital media experts. Our team size is now 32 and we will be filling up key positions over the next several months and are open to expat hires from the industry who want to hustle in India. What is your vision for HipBar? Immediate milestones. Our vision is to help people to upgrade and evolve their pallets for better and premium drinks, which results in a better experience. We also have to do it in a responsible manner keeping in mind what is sustainable. The meaning of sustainable growth in our mind is a situation of more people consuming less, than less people consuming more. Our immediate milestone is roll out the services in Bangalore, create full networks effect, and make it work for everyone, before we move to other cities. In the long term, we want find a place in the heart and mobile phone of anyone who can and does enjoy a drink.